1Médica de planta, Hospital San Vicente Fundación Rionegro. Rionegro, Colombia. 2Medicina interna y endocrinología, Hospital San Vicente Fundación Rionegro. Rionegro, Colombia. 3Dirección de investigaciones, Hospital Universitario San Vicente Fundación Rionegro. Rionegro, Colombia. 4Cirugía de trasplantes de órganos abdominales, Hospital San Vicente Fundación Rionegro. Rionegro, Colombia. 5Medicina interna y hepatología, Hospital San Vicente Fundación Rionegro. Rionegro, Colombia. 6Cirugía de trasplantes de órganos abdominales, Hospital San Vicente Fundación Rionegro. Grupo de investigación en trasplantes de órganos (INTRO). Rionegro, Colombia. This study was of patients who underwent liver transplantation has the objective of determining glycemia values ​​in each phase of liver transplant surgery and their relationships with post-operative morbidity and mortality. Liver transplant patients were identified in institutional records from 2013 to 2015. The information was taken from operative notes, laboratory records and clinical histories. We searched for differences in blood glucose levels during the three phases of transplantation and compared the incidences of infections and rejections for diabetics and non-diabetics. A total of 73 transplant patients were studied: 54.8% (n = 40) were male, the median age was 59 years (RIQ = 52-53), and 32.9% (n = 24) had histories of Diabetes Mellitus. Differences were found between initial and final serum glucose levels of diabetics (127 mg/dl vs. 212 mg/dl, p = 0.001) as well as in non-diabetics (105 mg/dl vs. 190 mg/dl, p < 0.000). 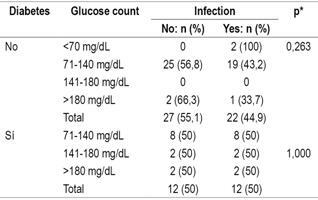 The proportion of rejection was highest among diabetics (14.3%, n = 7). No significant differences were found in the proportions of diabetic and non-diabetic patients who developed infections. Diagnosis of post-transplant diabetes was confirmed in 15.1% of the sample. Adequate monitoring of blood glucose levels during all trans-operative periods of liver transplantation can equalize the rate of infectious complications in diabetic and non-diabetic patients. Rejection continues to be more frequent among diabetic patients. An active search for post-transplant diabetes is necessary for every patient. Liver transplantation (LT) is the current treatment of choice for patients with chronic hepatic insufficiency, acute liver failure with indicators of poor prognosis, selected primary liver tumors and for some patients with inborn errors of metabolism. 1,2. Once the patient has been discharged and has prescriptions for immunosuppressors at maintenance doses, diagnosis of post-transplant diabetes can be established. According to previous publications, any of the criteria of the ADA or the World Health Organization (WHO) for diagnosis of DM can be used (Table 1). 13 Nevertheless, glycosylated hemoglobin (HbA1c) should not be used as the sole criterion in the first year after transplantation given its lack of diagnostic accuracy in this period. The main objective of this investigation was to determine glucose levels ​​in each phase of LT surgery and then determine their relationships with pretransplant diabetes, the appearance of infections, transplant rejection and postsurgical mortality. This is a retrospective cohort study of 73 adult patients who underwent LT using cadaveric donors in the Hospital San Vicente Fundación Rionegro between October 2013 and December 2015. Patients who died during induction of anesthetic were excluded (n = 3). The research protocol was approved by the Investigation Unit and the Research Ethics Committee of the Hospital San Vicente Fundación. The Hospital San Vicente Fundación is a national and regional referral center for transplantation. On average, 26 LTs from cadaveric donors are performed every year. LTs were performed with complete donor livers using a piggyback technique without venovenous bypass. An end-to-end portoportal anastomosis was created, then after organ reperfusion performed an arterial anastomosis was created. Histidine-tryptophan-ketoglutarate (HTK) was normally used as the preservation solution, but in isolated cases the solution from the University of Wisconsin was used. Central blood glucose was monitored in all patients before they entered operating rooms, anesthetic management was performed according to hospital protocols, intraoperative transfusions were performed based on hematocrit levels, and vasoactive agents were used according to the hemodynamic parameters of the patients. Intraoperatively, capillary glucose levels were measured with glucose meter strips during the hepatectomy, the anhepatic phase and the post-reperfusion phase of the organ. With the data obtained, a decision was made to either administer 10% dextrose in distilled water or administer regular insulin with a goal of maintaining intraoperative glucose level below 80 mg/dL. During the anhepatic phase, an infusion of 500 mg of methylprednisolone was administered for immunosuppression as per protocol. Data were obtained from the SAP electronic history system which stores information from hospital patients’ medical records. Information was extracted from clinical histories by researchers using a pre-designed standardized form. Additional data regarding infections in the postoperative period, organs affected and microorganisms identified by culturing were taken from the medical records. We evaluated whether criteria for diagnosis of post-transplant diabetes were met, whether the graft was rejected, and overall mortality from any cause. Data were processed using SPSS (IBM Corp. Released 2012. IBM SPSS Statistics for Windows, Version 21.0, Armonk, New York: IBM Corp.). Categorical variables for univariate descriptive analysis were expressed in absolute and relative frequencies. Quantitative variables were evaluated for normal distributions, and for normally distributed variables measures of central tendency and dispersion such as the arithmetic mean and standard deviation were used. Variables that were not normally distributed variables were described by means of medians and interquartile ranges (IQR). We looked for differences between patients who had diabetes before transplantation and those who did not have diabetes before transplantation in early infection, transplant rejection and mortality in the first 30 days after the procedure. Pearson’s chi-squared test (χ2) of was used for comparisons of qualitative variables, and the Mann-Whitney U test of independent samples was used for quantitative variables. In cases of repeated measures, the Friedman test was used. Differences were considered to be significant when p was less than 0.05. A total of 73 patients who had undergone LT between October 2013 and December 2015 were studied. Twelve transplants (16.4%) were performed in 2013, 31 (42.5%) in 2014 and 30 (42, 1%) in 2015. Male patients accounted for 54.8% (n = 40) of the study population, the median age was 59 years (IQR: 52-63.5. The youngest patient was 33 years old, while the oldest was 71 years old. LTs accounted for 90.4% of all procedures while the rest were combined liver and kidney transplantations. The median MELD score was 22 (IQR: 16-24), and the largest group of patients was Child-Pugh category C (41.1%, n = 30). This was followed by category B which accounted for 28.8% (n = 21). 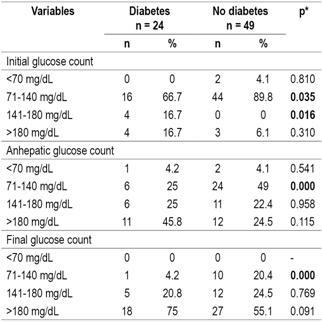 Of the total number of patients studied, 24 (32.9%) had histories of DM prior to LT. No differences between diabetic and non-diabetic patients before transplantation were found in MELD scores (p = 0.104, Mann-Whitney U from independent samples test or in Child-Pugh scores (Table 2). * Mann-Whitney U test of independent samples. ** Pearson χ2 test, Significance: p <0.05. Glucose levels were evaluated in the initial phase of the transplant, the anhepatic phase, and at the end of the transplant surgery. Significantly increased blood glucose levels were found in all patients including those with diabetes prior to transplantation and those without diabetes prior to transplantation (p < 0.000, Friedman test). The glucose level of diabetic patients was 127 mg/dL (IQR: 111-167) in the initial phase and 212 mg/dL in the final (IQR: 169-264) (p = 0.001, Friedman test) whereas for non-diabetic patients the initial blood glucose level was 105 mg/dL (IQR: 88-122), and the final glucose level was 190 mg/dL (IQR: 149-236) (p <0.000, Friedman test) (Table 3). * Median (IQR). ** Friedman test, significance: p <0.05. Glucose level variations during the three transplantation phases were greater in non-diabetic patients than in non-diabetic patients, but comparisons of final phase glucose levels to initial phase levels showed no statistically significant differences was found (p = 0.690). The comparison of stratified analyses of glucose levels in the three LT phases of LT for diabetic patients with those of non-diabetics showed that in the initial phase the highest proportion of patients presented glucose levels between 71 and 140 mg/dL (82.2%) while in the final phase the glucose levels of the largest proportion were over 180 mg/dL (61.6%). No statistically significant differences were found between the groups (Table 4). * Pearson’s χ2, significance: p <0.05. Evaluation of infections after transplantation found that diabetic patients suffered infections more frequently (50%) than did non-diabetics (44.9%). Evaluation of the relation between post-transplant infections and blood glucose ranges in the diabetic and non-diabetic patient groups shows no significant differences between the two groups in the initial phase (Table 5). Similarly, there were no significant differencesin the other two phases between the two groups. in any of the three phases nor in relation to the blood glucose levels in each of the phases of the transplant, both in diabetic and non-diabetic patients (Table 6). * Median (IQR). ** Mann-Whitney U test, significance: p <0.05. Most types of infections were more frequent among diabetic patients, but urinary tract infections were strikingly more frequent in non-diabetic patients (16.3%) than in diabetics (8.3%). (Table 7). * Fisher’s statistic. ** Significance: p <0.05. UTI: urinary tract infection. The overall percentage of patients who rejected grafts was 11%, but it was 14.3% in diabetic patients and only 4.2% in non-diabetic patients (p = 0.258, Fisher’s statistic). 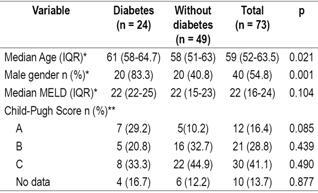 Overall mortality was 34.2%, but it was in 45.8% in diabetic patients, but only 28.6% in non-diabetic patients (p = 0.191, Fisher’s statistic). During outpatient follow-up of patients, 11 (15.1%) met the criteria for post-transplant diabetes. However, it is important for the analysis that no record of any follow-up of glucose levels was found in 16.4% of the medical records reviewed. Hepatogenic diabetes occurs in 30% to 60% of patients with cirrhosis. 3 In our study, patients with diabetes before transplantation had higher glucose levels than did non-diabetics. Similarly, blood glucose levels increased during the surgical procedure which is expected due to surgical trauma and glucocorticoid boluses. It should be noted that in the postoperative period glucose levels decreased progressively until appropriate controlled levels were reached in both diabetics and non-diabetics. This finding is explained by the intraoperative and postoperative treatment by the anesthesiologist. Previous studies have shown that high blood glucose levels are associated with a higher incidence of postoperative complications including surgical site infection, delayed healing and increased mortality.22,23 In our analysis, no association was found between high glucose levels during transplantation and the development of infections which is similar other authors’ findings. 24 These results may be due to the small sample size. Before transplantation, patients with diabetes had higher glucose levels, but during the procedure and at the end of the procedure similar glucose levels were achieved. This could explain why the complication rates found at the end of the study were not statistically different for the two groups. Hepatogenic diabetes stimulate a number intracellular signaling pathways including the Janus kinase/signal transducer and activator of transcription (JAK/STAT), nicotinamide adenine dinucleotide phosphate oxidase (NADPH oxidase), mitogen activated protein kinase (MAPK), extracellular signal regulated kinase [ERK] and c-Jun N-terminal kinase [JNK]. Together with the activation of transcription factors they have proinflammatory effects that allow increased expression of cytokines and growth factors and enhancement of the immune response to foreign bodies. 25 Our analysis found that this response was more frequent in non-diabetic patients before transplantation. Although this study, as do other retrospective studies, has significant limitations on data acquisition, striking information was found that should induce other LT groups to analyze their own blood glucose level and post-transplant diabetes statistics. Retrospective analysis of data from our fourth-level hospital in Colombia showed good control of blood glucose levels throughout the different phases of LT in patients with pre-existing DM. This could be due to the institution’s treatment scheme which provides for appropriate adequate levels of glucose throughout all phases of surgery. There was no evidence of a relationship between blood glucose levels and increased mortality or incidence of infections in our comparison of patients who had pre-existing diabetes with patients who did not have diabetes prior to LT. This is considered to be a consequence of adequate control of blood glucose levels in the patients analyzed. In spite of this, the group of patients with DM had a higher overall mortality rate which is mostly attributable to cardiovascular disease. With regard to the graft rejection rate, no statistically significant differences were found between the groups. Additional longer term studies with larger numbers of patients are required to evaluate this issue. Finally, the incidence of post-transplant DM in our analysis was similar to those found in other cohorts. There may have even been underreporting due to lack of data in some of the clinical histories. This raises the need for active search for DM in patients.